On Thursday, September 28 at 6:00 pm, Forest Hills Community Outreach will host an Award Ceremony to recognize local youth and area schools that took part in the 2017 Never Forget Tribute Youth Art Exhibition and Contest. Originally planned for September 11 but rescheduled to Thursday, September 28 due to Hurricane Irma, the Award Ceremony for the Never Forget Tribute Youth Art Exhibition & Contest is a free and family-friendly community event open to the entire public. It will take place at 6:00 pm at Forest Hills Funeral Home-Palm City Chapel located at 2001 SW Murphy Road in Palm City, FL 34990. The program will feature more than 100 artworks created by area middle and high school youth to honor the first responders, civilians and military heroes of September 11, 2001. Guests are encouraged to vote for their favorite artwork. As a gesture to show support and respect and to thank local First Responders for all they do for us every day, a banner will be available for community to write notes of thanks and appreciation to local First Responders. In appreciation for attending, each guest will receive a special September 11 Memorial Lapel Pin. This event includes an Appetizer Reception for all guests. 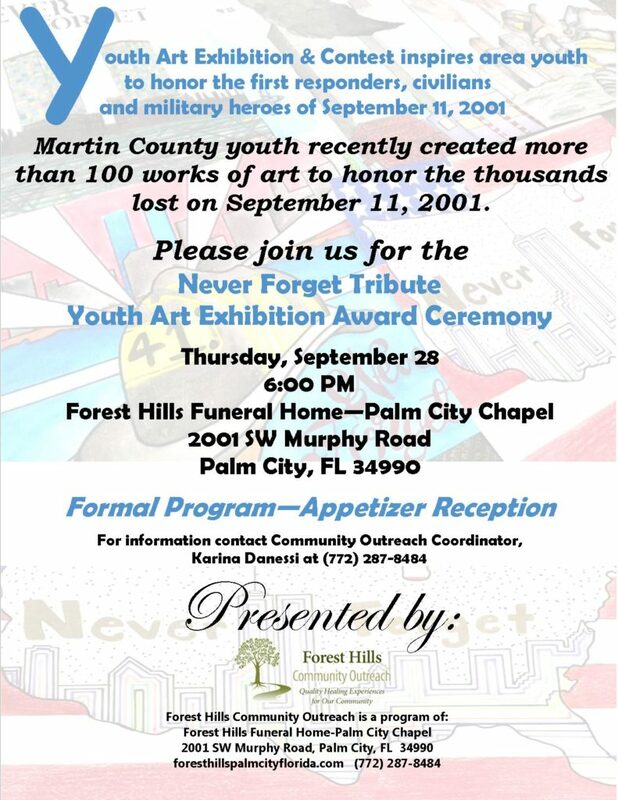 The Never Forget Tribute and Youth Art Exhibition & Contest is part of many activities and events conducted throughout the year by Forest Hills Community Outreach, a program of Forest Hills Funeral Home-Palm City Chapel. For information on free community events intended to enhance the overall well-being of the Martin County, FL community contact Community Outreach Coordinator, Karina Danessi at (772) 287-8484.